Over the last few articles in this series, we've learned how to use a handful of input types and validation attributes to natively validate forms. We've learned how to use the Constraint Validation API to enhance the native browser validation process for a better overall user experience. And we wrote a polyfill to extend support all the way back to IE9 (and plug a few feature holes in some newer versions). Now, let's take what we've learned and apply it to a real example: the MailChimp signup form. This file is 140kb (minified), and includes the entire jQuery library, two third-party plugins, and some custom MailChimp code. We can better! See the Pen Form Validation: The MailChimp Standard Signup Form by Chris Ferdinandi (@cferdinandi) on CodePen. First, let's grab a MailChimp form without any of the bloat. This is better, but it still includes some markup we don't need. Let's trim this down as much as possible. We can remove the div#mc_embed_signup wrapper from around the form. Similarly, we can remove the div#mc_embed_signup_scroll wrapper around the fields inside the form. We can also remove the text informing visitors that "* indicates required." Let's remove the .mc-field-group classes from around our form fields, and the empty class attributes on the fields themselves. We should also remove the .required and .email classes from our email field, since they were only used as hooks for MailChimp validation script. I went ahead and removed the * from the email label. It's totally up to you how you want to label required fields, though. We can also remove the .clear class from the div around the submit button. Let's remove all of the empty value attributes. Finally, we should remove the novalidate attribute from the form element. We'll let our script add that for us when it loads. All of this leaves us with a much more clean and modest looking form. 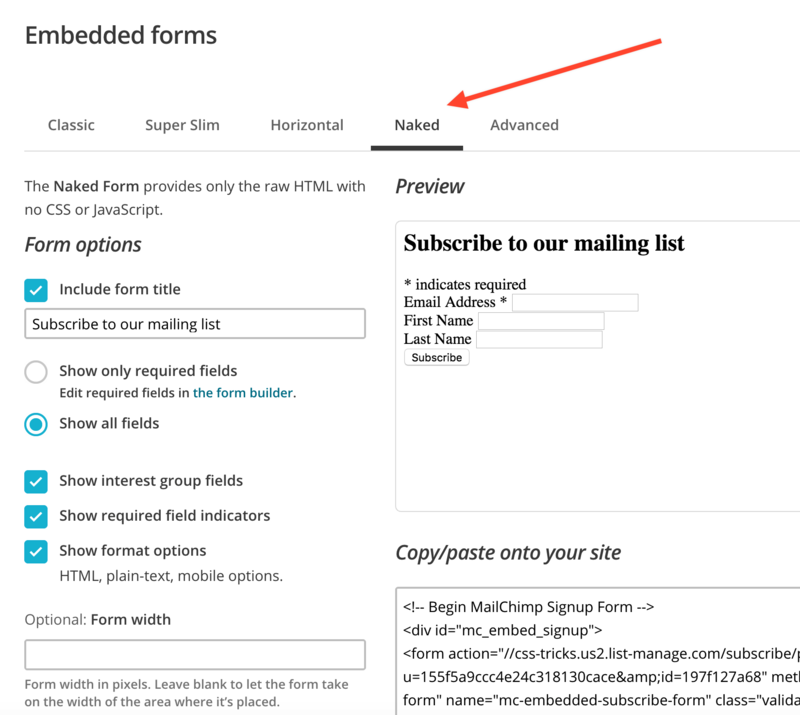 Since the MailChimp CSS is removed, it will inherit your site's default form styles. See the Pen Form Validation: The MailChimp Simple Signup Form by Chris Ferdinandi (@cferdinandi) on CodePen. Now, let's add in a few input types and validation attributes so that the browser can natively validate the form for us. The type for the email field is already set to email, which is great. Let's also add the required attribute, and a pattern to force emails to include a TLD (the .com part of an address). We should also include a title letting people know they have to have a TLD. This is a great starting point, but we can enhance the user experience by adding the form validation script we wrote earlier in this series. See the Pen Form Validation: MailChimp with the Constraint Validation API by Chris Ferdinandi (@cferdinandi) on CodePen. Our validation script is just 6.7kb before minification, making it 20x smaller than the one MailChimp provides. If we want to ensure support back to IE9, though, we should include our Validity State polyfill and Eli Grey's classList.js polyfill. See the Pen Form Validation: MailChimp with the API Script and Polyfills by Chris Ferdinandi (@cferdinandi) on CodePen. That brings our total file size up to 15.5kb unminified—still 9× smaller than the MailChimp validation script. The `mc-validate.js` script provided by MailChimp doesn't just validate the form. It also submits it with Ajax and displays a status message. When you click submit on our modified form, it redirects the visitor to the MailChimp site. That's a totally valid way to do things. But, we can also recreate MailChimp's Ajax form submission without jQuery for a better user experience. The first thing we want to do is prevent the form from submitting via a page reload like it normally would. In our submit event listener, we're calling event.preventDefault if there are errors. Instead, let's call it no matter what. See the Pen Form Validation: MailChimp and Prevent Default on Submit by Chris Ferdinandi (@cferdinandi) on CodePen. The mc-validate.js script uses JSONP to get around cross-domain security errors. JSONP works by loading the returned data as a script element in the document, which then passes that data into a callback function that does all of the heavy lifting. First, let's set up a function we can run when our form is ready to be submitted, and call it in our submit event listener. The first thing we need to do is get the URL from the form's action attribute. In the `mc-validate.js` script, the /post?u=' in the URL is replaced with /post-json?u=. We can do that quite easily with the replace() method. Next, we want to grab all of the form field data and create a query string of key/value pairs from it. For example, FNAME=Freddie%20Chimp&EMAIL=freddie@mailchimp.com. Let's create another function to handle this for us. Now, we want to loop through all of our form fields and create key/value pairs. I'll be building off of the work done by Simon Steinberger for this. First, we'll create a serialized variable set as an empty string. Now let's grab all of the fields in our form using form.elements and loop through them. If the field doesn't have a name, is a submit or button, is disabled, or a file or reset input, we'll skip it. If it's not a checkbox or radio (a nice catchall for select, textarea, and the various input types) or it is and it's checked, we'll convert it to a key/value pair, add an & at the beginning, and append it to our serialized string. We'll also make sure to encode the key and value for use in a URL. Finally, we'll return the serialized string. See the Pen Form Validation: MailChimp with Ajax Submit - Serialized Form Data by Chris Ferdinandi (@cferdinandi) on CodePen. Now that we have our serialized form data, we can add it to our URL. A key part of how JSONP works is the callback. Traditional Ajax requests return data back to you. JSONP instead passes data into a callback function. This function has to be global (as in, attached to the window rather than inside of another function). Let's create a callback function, and log the returned data in the console so that we can see what MailChimp sends back. Now we can add this callback to our URL. Most JSONP use callback as the query string key for this, but MailChimp uses c.
Now we're ready to inject our script into the DOM. First, we'll create a new script element and assign our URL as it's src. Next, we'll grab the first <script> element we find in the DOM, and inject our new one just before it using the insertBefore() method. Finally, we'll remove it from the DOM after our script loads successfully. Right now, our callback method is just logging whatever MailChimp responds with into the console. If you look at the returned data, it's a JSON object with two keys: result and msg. The result value is either error or success, and the msg value is a short string explaining the result. See the Pen Form Validation: MailChimp with Ajax Submit - Result by Chris Ferdinandi (@cferdinandi) on CodePen. Let's add a <div> to our form, just before the submit button, that we'll use to add our error or success message. We'll give it a class of .mc-status. In our displayMailChimpStatus() function, we want to find the .mc-status container and add our msg to it. We can style the message differently depending on whether the submission was successful or not. We already have some styles set up for our error messages with the .error-message, so let's reuse those. We'll create a new class, .success-message, for successful submissions. Now, we can conditionally add one of our classes (and remove the other) based on the result. See the Pen Form Validation: MailChimp with Ajax Submit by Chris Ferdinandi (@cferdinandi) on CodePen. While our message will be easily spotted by sighted users, people using assistive technology like screen readers may not inherently know a message has been added to the DOM. There's a good chance this will add a blue outline to our status message. This is a really important accessibility feature for links, buttons, and other naturally focusable content areas, but it's not necessary for our message. We can remove it with a little CSS. We now have a lightweight, dependency-free script that validates our MailChimp form and submits it asynchronously. Our completed script weighs 19kb unminified. When minified, the script weighs just 9kb. That's 15.5× smaller than the version MailChimp provides. You have a problem with your regular expression there, it passes email addresses that are longer than the email address format specification allows (64 characters for local part, and 255 in total including the domain). This will be useful for a lot of people who use mailchimp forms and don’t want the extra fluff. Thanks for writing this! Thank you for this great blog. Very useful as I was about to star looking into optimisation of the Mailchimp form. A question regarding the HTML code. Shouldn’t the name of the hidden input field be the same as the combination of the parameters ‘u’ and ‘id’ from the post url?